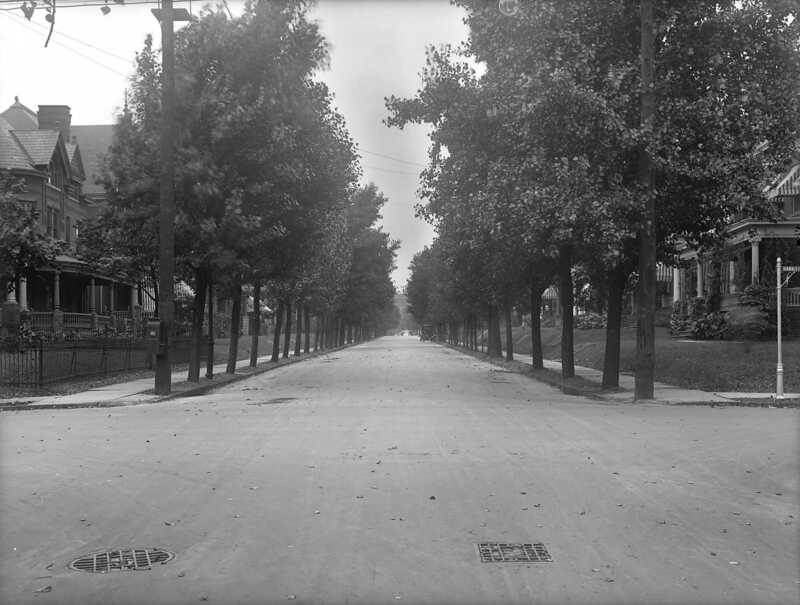 View of an unidentified Bloomfield street, being taken from Harriet Street. A public mailbox is attached to the first telephone pole on the left. If you take one step forward in the image, its easier to recognize the house on the left as the one in the picture. I think this is tagged wrong. I believe the historic photo is looking North from Harriet onto the 300 block of S. Atlantic Ave. The grade of the lawns is what led me to think this attribution to S. Pacific might be inaccurate. If you look at the current street view of S. Atlantic from Harriet St., you can match up the first two houses left/right in the historic photo with the second two houses left/right on S. Atlantic Ave, by the rooflines on the left and porch columns on the right. Plus the grade of the front lawns is much more similar.